Last week I was profoundly inspired while reading a beautiful post in My French Heaven. Stephane’s Simple Crème d’asperge was magnificent! 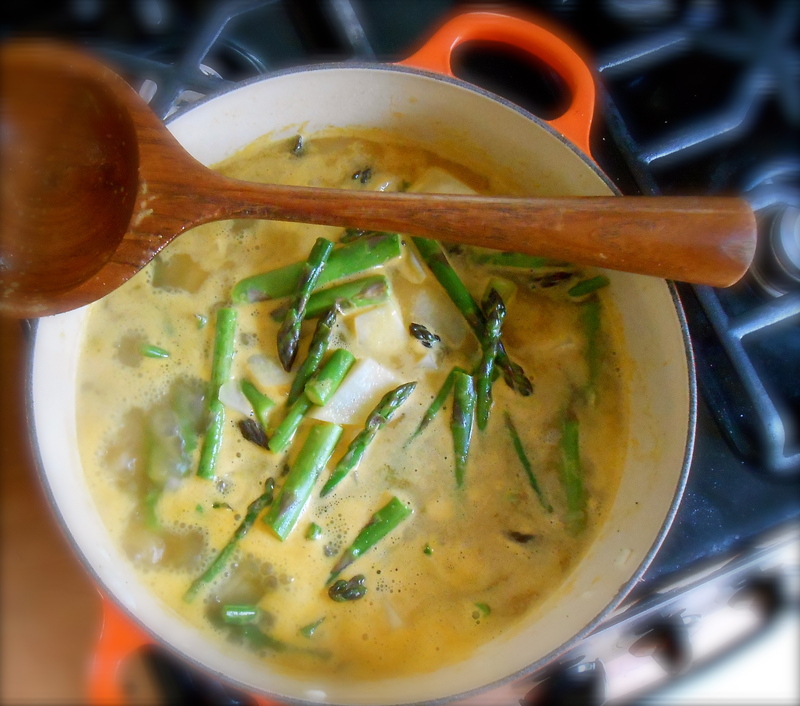 I loved her minimal ingredients and simplistic method of cooking asparagus soup. I happened to have asparagus in my refrigerator and decided right then and there we were going to have her soup. Her recipe was indeed wonderful. We loved every silky spoonful! Next trip to the market I was awe struck at the sight of a mountain of asparagus! I had to buy some more. I picked out a nice bunch and then noticed the price per pound. I do not think I have ever seen asparagus so modestly priced. Do you think I bought too many? Obviously we are having a very productive asparagus growing season here in Washington state. Our temperatures have been warming up for several weeks topping out at 80° for a couple of days. This week the rain is falling and it has cooled off to a comfortable 65°…perfect! This soup recipe is very different from Stephane’s. Her soup was so smooth and much lighter. And the nutmeg added such a nice subtle flavor. Using a blender rather than straining gave this soup a heartier consistency. I added a drizzle of lemon dressing to give it some zing. In a heavy soup pot heat butter over medium high heat and cook the onion until soft. 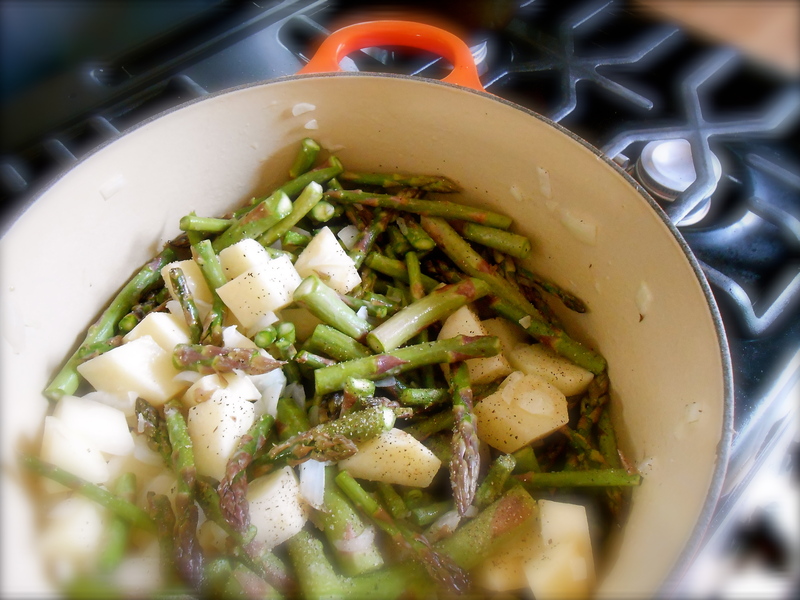 Add the potatoes, asparagus, salt, pepper and stir to coat well. Pour the vegetable broth in and bring to a boil. Lower the heat and slow boil until potatoes are tender. Blend the soup to desired consistency. Mix all three ingredients in a small bowl and stir with a fork. Drizzle on top of individual servings. Delicious soup and the asparagus looks so fresh. Love the lemon drizzle. Oh yum. 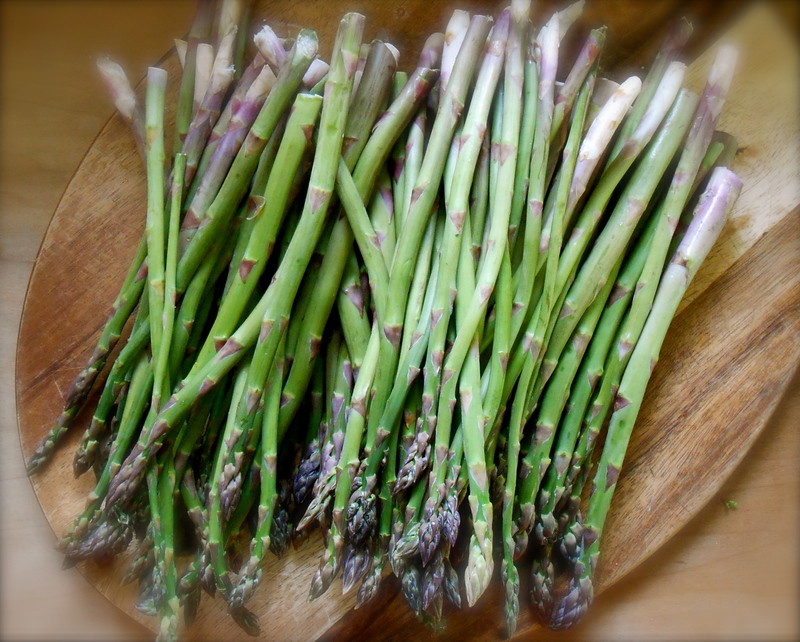 I just love asparagus at this time of year!! I’m definitely gonna have to book mark this one and try it! Thank you Fae. I usually make that dressing and toss it on steamed asparagus. I thought of trying it this way and was pleasantly surprised. I’m glad I am not the only one who can overdo the purchasing when the prices are down. Lovely looking soup and great photographs. This soup looks utterly delicious! We all love asparagus in our home and I’ve never made asparagus soup. There’s a first time for everything and this is the recipe I’m using for my first asparagus soup! You know, I have never made asparagus soup even though I eat it very often, so I think its high time I made some asparagus soup. I’m going to try doing this in the next two weeks. Will let you know how everything turned out. Thanks for stopping by and have an awesome weekend. Hi Liz. This soup was very good. I decided to make the lemon dressing because the soup is not really seasoned, except with the butter and salt. I make this type of lemon dressing and toss it with steamed asparagus so I decided to try a little drizzle on top of our soup. We enjoyed it very much. Please let me know your opinion if you do make it. :) Great weekend to you too! I made this soup today and is was very nice. Many thanks! I am so happy to hear this Rosa. Did you drizzle the lemon sauce on top? Thank you for letting me know. Your soup sounds delicious…I’m sure the lemony dressing really punched up the flavor. 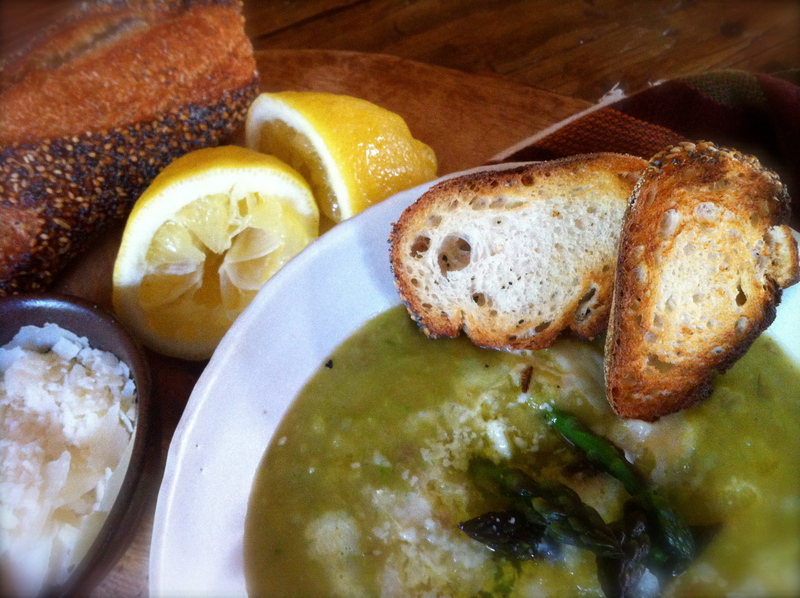 You are currently reading asparagus potato soup with a lemony drizzle at COTTAGE GROVE HOUSE.